Winter weather in Texas is crazy. Which, unfortunately, causes my skin to act up. My biggest issue during the winter is my skin looking dull and dry. So this year, I decided that I wasn't going to just try to work around it. So my New Year's resolution is to: Spoil my skin the way it deserves. I wanted to start with a good base and a routine that I could easily keep up with all year. 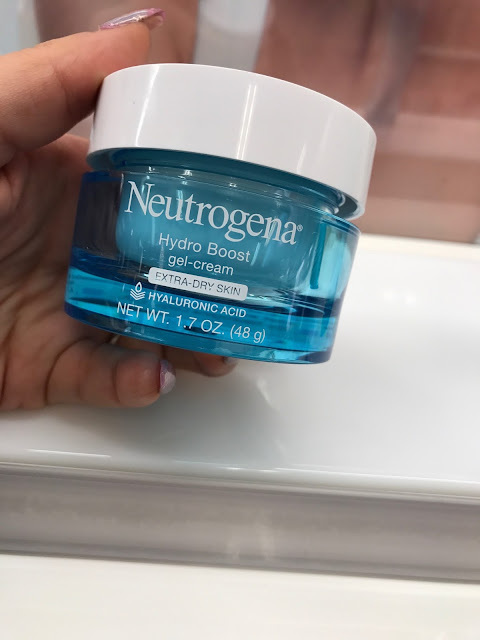 This is where Neutrogena Hydro Boost comes in! So join me in making a commitment to better skin with Neutrogena Hydro Boost which is available at Walmart. It helped my skin look so smooth and my makeup went on like a dream. The result was instant, as soon as I put it on my skin looked more supple. The hyaluronic acid is naturally found in skin and helps replenish the skin's water reserves. The rest of the line includes a hydrating tint, hydrating concealer, hydrating lip shine. All of them used together are going to give you perfect base for any day or night look! The Hydro Boost gel cream was heaven sent. I have been working late nights and early mornings and I suffer from dark circles around my eyes and wearing this over night has made a tremendous difference in the way my dark circles look. The Hydro Boost line also has a other amazing products such as the Hydrating Tint which is a natural coverage infused with hydration, weightless water - gel plumps the skin and boosts hydration. It also has a concealer, Hydro Booost Hydrating Concelear provides smooth and buildable coverage and flawlessly masks my dark circle imperfections. I love that its non greasy, its lightweight and it works hand in hand with the gel cream. Than there is a Hydro Boost Hydrating Lip Shine and a lip treatment. The Lip Shine moisturizes at the same time, fills in the lines in my lips so that my lips feel and appear soft and smooth and both the lip treatment and lips shine makes lips look & feel hydrated for up to 24 hours. Ladies, always remember that our skin is important. We have to take care of the one beautiful face we have and using these products will help revitalize our skin and our appearance. Click HERE for more info regarding the products!